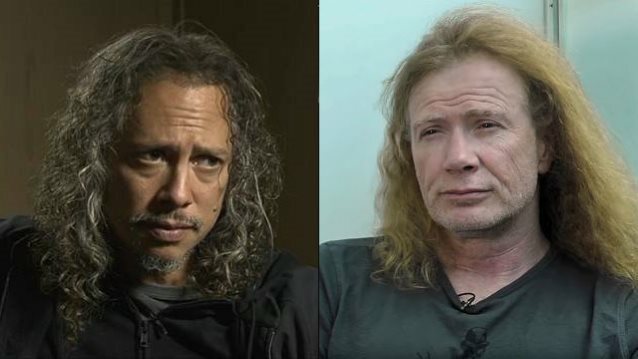 Kirk Hammett says that reconnecting with Dave Mustaine at METALLICA's 30th-anniversary shows helped the MEGADETH frontman let go of some of his sadness, anger and frustration over being fired from METALLICA. During an appearance on the "Word Of Wheeler" podcast, Hammett spoke about his current relationship with Mustaine. He said (hear audio below): "Well, you know, the whole thing with Dave is I've never, ever, ever had a problem with Dave. I've always seen Dave as someone who was just really, really sad, really angry, really frustrated about his situation with METALLICA, and he never could let that go. And, you know, I've always shown a lot of empathy for him, understanding that he was just pissed off. It's the equivalent of the woman of your life leaving you. I mean, really. When your band kicks you out… I've never been kicked out, but I can imagine it's a horrible experience, especially if it's a band that you feel really passionately about. So I can understand Dave's plight over all these years. But I will also say that when we did these 30th-anniversary shows at the Fillmore [in San Francisco], and we invited Dave to play on all those 'Kill 'Em All' songs, man, it felt so good to have him playing on stage. It felt perfectly fine for me to, while Dave was playing the guitar solos, for me to go over to James [Hetfield, METALLICA frontman] and play the rhythm parts with James, and it wasn't a big deal at all. And I could see from the look on Dave's face and just from his whole attitude that it was super-cathartic for him. And I could see how it was helping him. And so I just took it all in stride. And it's interesting, because since then, I think, Dave's relationship with us is a little bit better now. I'd like to think that that whole thing just kind of healed some scars that needed to be healed." Mustaine joined his former METALLICA bandmates on stage on December 10, 2011 for the fourth and final intimate show in San Francisco as part of the group's week-long celebration of its 30th anniversary as a band for fan club members only. He later told the Chicago Sun-Times about the experience: "I played four or five songs with them [at the Fillmore show] — just me, James, Lars, Robert [Trujillo] and Kirk was over on the side. Kirk didn't look too happy about it, but I think he was a good sport. "I think you can see from the way the guys lit up that it was mutually beneficial for everybody. We all expected something magical to happen, and it did. We were playing stuff off the first record that I'd written in my teenage years. It was a blast." In a separate interview with Loaded Radio, Mustaine said that he thought it was "awesome" that he was invited to play with METALLICA at the Fillmore. He recalled: "I had asked them, 'Do you want me to just play rhythm?' Because, you know, Kirk's in the band. And Lars said, 'No. Play your stuff.' And I went, 'All right. Now we're talking.' So I went up there and I did my thing. And it was great. I imagine it must have been really awkward for Kirk watching me play the songs the way that they were supposed to be played in the beginning, but that's open for his artistic interpretation. If he doesn't wanna play it the way that I played it, hey, that's cool." Five months after the Fillmore show, Mustaine apologized to Hetfield for publicly discussing the fact that Dave wanted to assemble a "supergroup" combining Mustaine and MEGADETH bassist David Ellefson with Hetfield and Ulrich. Mustaine's apology came after Hetfield laughed off talk of a possible collaboration between members of METALLICA and members of MEGADETH, calling it "crazy" talk on the part of Mustaine. Hetfield told So What!, METALLICA's fan club magazine, "I see [Mustaine] healthier now. I see him as less of a bitter guy. But I do see a lot of stuff in the press with him talking about jamming with us and making an album. All this other crazy stuff. I read it and say to myself, 'Hold on. This is the Dave that we kind of wanted to forget about. You know, the big-mouth that wants to just go-go-go. But there is an authenticity about him when he speaks. He doesn't think too much before he does. He just goes off the cuff. Plus, when he says stuff like that, it's well-intended."